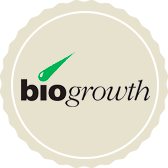 Biogrowth | Willard Agri-Service of Frederick, Inc. The Biogrowth product line biologically enhancing plant growth. We learn more every day about the relationship between genes, microbes, plant hormones and nutrition. Enhancing these relationships to optimize nutrient uptake, manage stress in your crops and increase your profitability is what the Biogrowth line of products is designed for. It’s an organic acid that is biologically active in the plant, improving plant respiration in the mitochondria. The net result is enhanced internal movement of nutrients and hormones, increasing growth and yield. The addition of Biogrowth-NE to Nutriblend and infurrow fertilizers increased corn yields by 9.5 bu/acre. The inclusion of Ascend (pgr) accentuates the biological activity by an additional 4 bushels. Apply 8 oz. of Biogrowth NE with Infurrow or Nutriblend banded starters at planting. The addition of the PGR Ascend at 5 oz. enhances the results. For the most effective results, always apply with balanced plant nutrition.